The United States Football League’s Atlantic Division matchup between the New Jersey Generals and Philadelphia Stars on March 11, 1984 featured two teams that had thus far been carried by their defenses in achieving 2-0 records. 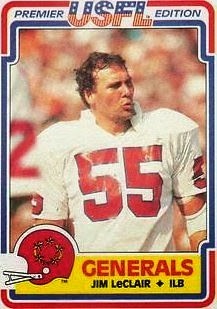 The Generals, coached by Walt Michaels, were benefiting from an influx of veteran talent on defense that included linebackers Bobby Leopold, Jim LeClair, and Willie Harper, CB Kerry Justin, and FS Gary Barbaro. The offense, which had relied most heavily on RB Herschel Walker in 1983, added ex-Browns QB Brian Sipe, but he had gone down with an injury in the first week and backup Gene Bradley was behind center. Philadelphia, which barely lost the USFL Championship game the previous year, continued to rely on a ball control attack led by QB Chuck Fusina and featuring RB Kelvin Bryant. But the offense had scored just 17 points in each of the first two games and it was the blitz-heavy defense keeping opponents in check. There were 46,716 fans in attendance at Giants Stadium in the New Jersey Meadowlands for the Generals’ home-opening game. The contest was played in near-freezing temperatures with wind gusts of nearly 35 miles per hour. Fans occasionally tossed snowballs onto the field despite the dire warnings coming over the public address system and, as a result, 14 were arrested and 57 ejected during the course of the afternoon. The Generals got the first break of the game when, forced to punt after their first series, the ball bounced into CB Jonathan Sutton and New Jersey recovered at the Philadelphia 29, but they were unable to move afterward. The Stars had a drive that was helped along by a fake punt that converted a fourth down, but David Trout’s 52-yard field goal attempt hit the right upright and was unsuccessful. In a 10-play, 65-yard series that extended into the second quarter, the Generals, who ran the ball effectively, were helped along the way when a pass by Gene Bradley was overthrown in the end zone but SS Antonio Gibson was penalized for defensive holding. FB Maurice Carthon scored a touchdown on a one-yard dive into the end zone two plays later and Roger Ruzek added the extra point. The Stars responded by driving 74 yards in 16 plays that culminated in a scrambling Chuck Fusina firing a pass to WR Willie Collier, who made a diving catch in the end zone for a seven-yard TD on third-and-goal. Trout tied the game at 7-7 with the successful conversion. That was the score at halftime. With 53 seconds left in the period, FS Mike Lush intercepted a Bradley pass to give the Stars the ball at the New Jersey 43. However, they came up empty when Trout again hit the right upright on a 45-yard field goal try. The Generals forced a turnover on the first play from scrimmage of the third quarter, with Bobby Leopold causing Kelvin Bryant to fumble at his own 42. New Jersey made the most of it, driving to another Carthon one-yard scoring carry that was set up by a 20-yard run by Walker. Ruzek’s PAT gave the home team a 14-7 lead. Once again the Stars followed a New Jersey TD with one of their own, driving methodically down the field and ending with Fusina tossing a four-yard scoring pass to TE Steve Folsom. Trout tied the score at 14-14 with the PAT. The Generals had to punt on their next series, but on the last play of the third quarter, a fumble by Bryant at the Philadelphia 40 was recovered by New Jersey’s Jim LeClair. It set up a 38-yard field goal by Ruzek six plays later that put the home team in front once more with over ten minutes left to play. The teams traded punts, and the Stars appeared to be on their way to a score with time running down, converting a fourth down and moving into Generals territory. However, LeClair recovered a fumble by WR Willie Collier, who lost the handle on the ball after making a catch at the New Jersey 21 with 1:23 left in the contest. Philadelphia got one last shot with the clock down to ten seconds, but Fusina’s long pass was intercepted by Leopold to seal the 17-14 win for the Generals. The Stars won the statistical battle, leading in total yards (245 to 164) and first downs (18 to 10). However, they also turned the ball over five times, to one suffered by New Jersey, and had the two close misses on field goal attempts. Maurice Carthon led the Generals with 71 yards on 18 carries that included the two short touchdowns and Herschel Walker, who was generally well defensed by Philadelphia, added 56 yards on 17 attempts. Gene Bradley completed just 5 of 13 passes for 37 yards and had one intercepted. WR Tom McConnaughey led the receivers with two catches for 23 yards. On defense, Bobby Leopold (pictured below) forced both of Bryant’s fumbles and made the game-clinching interception while Jim LeClair had two key fumble recoveries. For the Stars, Kelvin Bryant ran for 87 yards on 24 attempts had four catches for 34 more yards, but also fumbled the ball away twice. Chuck Fusina was successful on 19 of 30 throws for 125 yards and two TDs along with the late interception. Steve Folsom caught 6 passes for 43 yards and a score. The Stars recovered to win all of their remaining games – with the exception of the last-week rematch with New Jersey – to finish atop the Atlantic Division once again at 16-2. The Generals lost the following week but ended up with a 14-4 record to place second in the division. In the First Round playoff game, the clubs met for a third time and it was Philadelphia winning by a decisive 28-7 score, on the way to attaining the USFL Championship.